Torrent + Direct - Samdrivers 18.11 - Collection Of Drivers For Windows (x86x64) [multi] | Team OS : Your Only Destination To Custom OS !! Description: Collection of drivers from SamLab.ws for all 32-bit and 64-bit Windows operating systems, starting from Windows 2000 and up to Windows 10 including server platforms. As the installer shells for auto-detecting your hardware and automatically installing the necessary drivers, we used specialized utilities: DriverPack Solution 16.17.6 Plus / Drivers Installer Assistant 8.02.20 / Snappy Driver Installer 1.17.8.1 / DRP 17.7.58 / Backup Drivers Backup shell Solution 3.90.21. 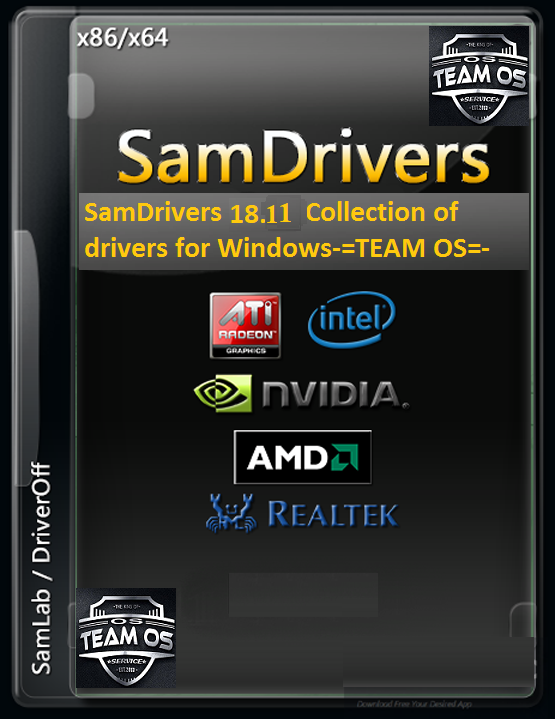 The collection includes the most current drivers for the release date collected by SamLab personally. Do not confuse this package with the driver-packs from Bashrat'a - these drivers are newer and more stable. Thank you for this share, great work @The Rain. downloading not start "finding peers 0.0%"
Thank you very much for this great pack !!! Thanks a lot The Rain, will seed for a few hours!! Thanks, yet again, for a great job.